It was beginning of August when we reached Delhi. We had taken NH2 to travel all the way from Kolkata to Delhi. Our plan was to spend four weeks in the Himalayas on wheels. As the best time to visit the Valley of Flowers is July/ August when entire area dazzles with flowers. We decided to go to the Valley of Flowers to start with. We drove down to Hardawar where we were joined with Amar Singh an ex-vehicle driver of the Indian army with tremendous experience in mountain driving. We drove out early next morning traveled 300kms through Hrishikesh, Devaprayag, Sri Nagar, Rudraprayag, Nanadprayag, Chamoli, Joshimath and Vishnuprayag to Govindghat. The entire route had kept us spellbound with Himalayan landscape. By early afternoon, we had retired in Forest Rest house of Govinghat. The Alkananda River gurgles down the hills just next to the rest house. We had walked down to the bazaar and had hot puri-sabji with jilaibi as dessert before retiring for the night. While at the bazaar, we arranged porters to accompany us. We saw horses, dandis and kandis were available to take people to Hemkund Sahib but we were reminded that animals were not allowed inside the Valley of Flowers. We spent a little time at the Gurdwara speaking to tourists returning from the Valley of Flowers and Hemkund Sahib. Our trek started next day when we crossed the Gurdwara and the hanging bridge over the Alkananda and climbed to the check post of Eco Development Committee of Bhuyinder. Here we entered our details and paid a toll tax of Rs. 25. Now we were trekking along the natural beauty and the gurgling Laxmanganga that had raised from Hemkund. We could see down below far off the confluence of the Alkananda and the Laxmanganga. Our constant companies were innumerable beautiful swift fountains. Flora of the area is very varied and the birdlife was plentiful. At every bend of the trail we met a new snow-bound peak. After a trek of 3 kms we were at Pulnagaon where we took rest with hot cups of tea, mostly milk and plenty of sugar. Our destination was Ghangharia. On the way we passed Dandishal, Bhuyindargaon and reached Khoolna Bridge where we crossed the river and further a kilometres trek took us to Ghagharia. Though there are some hotels and GMVNs tourist lodge, as we had our reservation at Forest Bungalow. So we left our luggage at FRH and went out to see slide show of the Valley of Flowers at Nature Interpretation Centre. Early morning was pretty cold even in August as the height of Ghangharia is 10,000ft. But we left our rest house by 6 A.M. and started our hike towards Hemkund Sahib. Our rucksacks were heavy as we were carrying raincoats, enough mineral water, and tinned and dry food. We also had butane stove for emergency. The distance of Hemkund Sahib from is about 5/6 kilometres but the route gains 5,500ft in height. So it was a struggle all the way. We reached the bifurcation of the trail at Forest check post. The left trail takes you to the Valley of Flowers while the straight one goes to Hemkund. The trail, though is made of stone slabs, is very uneven and as we kept climbing to the upper region, we were tiring faster because of lack of oxygen in the air. The number of trees was diminishing faster. But we had lovely company of Sikh pilgrims and joined their shouting merely by calling out "Jo Boley So Nihal, satsri akal". As we came within a kilometre Hemkund again the road bifurcated. Stepped way has gone direct to Hemkund and the left trail has gone by the way of the glacier. We selected the left trail as we always found stepped routes were more tiring. We could see large number of Bramhakamals. There are stringent rules to protect these rare flowers as slowly but steadily these are becoming extinct. By early noon, we reached the kund. Water of the kund is crystal clear and many pilgrims were bathing in ice cold water. The loveliest scenery is that of the glaciers reaching into the water of Hemkund. We were permitted to go up to a demarcated area as beyond that is dangerous. There is a two-storied Gurdwara where one can stay and get food free of charge. There is also a temple of Laxman and it is believed that Laxman had meditated here. But Hemkund Sahib is the premiere holy place of the Sikhs. They believe that tenth Guru Govind Singh, in his previous birth had meditated here. Hemkund is located at a height of 4,329 metres. We were told that weather starts packing up from late afternoon. So we left Hemkund for Ghangharia by 2 P.M.
We spent the night at FRH of Ghangharia and next morning left for the Valley of Flowers. The Valley of Flowers is situated in the core area of the Nanda Devi biosphere. The valley was discovered by accident by Frank S Smythe and R L Holdswirth while they were returning from expedition to Kamet in 1931. 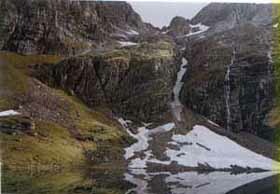 Smythe had returned to the Valley of Flowers in 1937 and had written a book called " The Valley of Flowers". When this book was published, world came to know of this natural wonder. The Valley of Flowers has an area of 88 sq. km. And its height varies from 3,200 metres to 6,675 metres. While most of the time the valley sleeps under thick cover of snow but in July-August, 300 species of flowers can be seen here. Besides flowers the valley is a habitat of butterflies, musk deer, blue sheep, Himalayan bear and snow leopard. In 1981, the Valley of Flowers was declared a national park and many restrictions were clamped on tourists. Hemkund Sahib We approached the valley through forests of oak, spruce and silver birch. Slowly the valley opens out. 5000-6000 m peaks, tapering off into grassy alpine slopes lower down flank it. A number of waterfalls and streams flow from the heights, into the Pushpawati River, which emerges from glaciers near Rataban and joins the Bhyundar Ganga and then the Alaknanda. The main valley and the path for walkers are on the Right Bank of the river. There are wildflowers everywhere, a sea of green dotted with pink and yellow and red. In the middle, almost randomly placed. There are the Himalayan blue poppy and the cobra lily. Its beautiful. The sun breaks through the mist and, in a magical moment, the valley becomes a riot of colour. Its truly an enchanted valley. Locals of Bhyundar Valley knew the place of fairies and nymphs even before Frank Smythe. They just called it Phoolon ki Ghati. We walked through fields of flowers and alpine slopes, to a waterfall and a panoramic view. 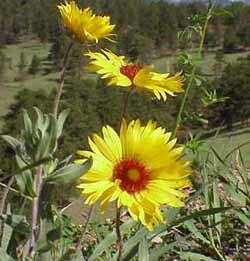 From here we can see varieties, in the colonies of flowers, that werent visible earlier. From the top of the mountain we spot a flag marking the grave of the English botanist who died in an accident while exploring the valley in 1939. We detect polygluma, which prevents other flowers from growing. When the government declared the Valley of Flowers a National Park in 1981 and when they banned sheep grazing, polygluma weed grew in abundance. The sheep previously ate these. But now has invaded and swamped the more delicate alpine varieties of flower. Pushpawati River flows through the valley. We crossed the river by a wooden bridge and then passed a small glacier. Now we were among the millions of flowers. We could identify geraniums, premolars, Himalayan blue poppies, lilies, but here were thousands of unknown flowers. The beauty had made us speechless. Descending down, we reached the tomb of the naturalist Joan Margaret Leghi who was killed here in an accident. Sooner the weather deteriorated. Since spending a night at the Valley of Flower has been prohibited, we began our trek back to Ghangharia, leaving behind a fairyland and an unforgettable experience of the most beautiful natural splendour. How to go: Reach Hardwar by train from Howrah. Then bus will take you to Govinghat. Fare is Rs 225. Then the trek starts. Places to stay: There are Forest Rest Houses at Govindghat and Ghangharia. For reservation apply to the Deputy Conservator of Forest, Nanda Devi National Park Forest Division, Joshimath, Dist. Chamili, Uttaranchal. Garhwal Mondal Vikash Nigam has a Rest House at Ghangharia. Season: Though the season is from June to October but for seeing the Valley of Flowers in full bloom, one should be in the Valley in July-August.